I was just looking again at that weird sun yesterday. It looked like an eclipse! Helped along by the smoke from that smokestack at the fire station. With all that excitement I forgot this news flash: Not to disappoint people but I finally took down my Christmas tree. Sunday was, ahem, Septuagesima Sunday, which heralds the dawn of Lent. In the Traditional Calendar it is as if we start Lent early. Thanks a heap, Traditional Calendar! Although last year it began a lot earlier than this year. Last year Septuagesima Sunday fell on Mozart's birthday. The way it works is Septuagesima means 70 days, then Sexagesima, 60 days, then Quinquegesima, 50 days. Then you hit Ash Wednesday at the 40-day mark and bang, you are into Lent. These are approximate numbers of course. But you get the idea. Thinking of all this brings back my time in California with Leonard. I was new to the Latin traditional Mass and Pennario and I used to discuss it and he used to explain things to me sometimes. And yes, we giggled about Sexagesima Sunday. How can you not? "Mea culpa, mea culpa, mea maxima culpa," Pennario used to say, with that smile of his. If you are new to Latin that means, "through my fault, through my fault, through my most grievous fault." It is part of the Public Confession you make of all your sins. See all the drama you miss not going to the traditional Mass. It is far more poetic and thrilling. Anyway there is your trip down the Latin memory lane! Now the tree is packed away -- carelessly, I might have to go and re-pack it, but still. The space is cleared, and the sunlight is pouring in. I love winter and I hate to see it go. But from now on, as far as I am concerned, it is spring. It is early spring. 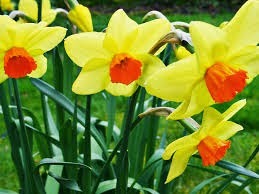 It is time to start checking for the daffodils!